How do Motorola's low cost smartphones compare? Motorola has launched the low-cost Moto E and the upgraded Moto G 4G, as it looks to secure its dominance at the budget end of the mobile market. Last year's Moto G became the firm's best selling phone of all time, so the signs are promising for the E and G 4G as they join the G in a solid trio of low-end handsets. So how do they compare? We'll take you through the three devices so you can see which one would be best for you. When it comes to design the Moto G and Moto G 4G are identical, with the same chassis and button placements. You can peel off the rear covers and swap them for different colours, and the cover on the Moto G will fit on the G 4G and vice versa. The only difference between the two is the inclusion of the microSD slot, which takes the place of the SIM slot on the original Moto G.
The SIM port on the Moto G 4G is now found on the opposite side, towards the base of the device. Meanwhile over on the Moto E things aren't hugely different in terms of style, but Motorola has made a few adjustments. There's no longer a speaker grill on the back as it's been moved to below the screen on the front of the handset, while the front facing camera has been completely removed. The Moto E measures 124.8 x 64.8 x 12.3mm and weighs 142g, while the Moto G and G 4G rock up with vital statistics of 129.9 x 65.9 x 11.6mm and 144g. The Moto G is technically 143g - but you won't notice the difference in hand. All three sit equally well in the hand, and the curved rears mean they nestle snugly into your palm for a secure grip. This also means you can easily reach all corners of the screen with one handed use. It's more of the same with the Moto G and G 4G, with a 4.5-inch, 720 x 1280 display adorning both handsets. This provides a pixel density of 326ppi, the same as the iPhone 5S, only on a larger screen. The Moto E has a smaller 4.3-inch display and a slightly less impressive 540 x 960 resolution meaning it's not as defined as the G duo, but it's still very usable. In terms of pixel density it sits a 256ppi which is slightly better than the Nokia Lumia 520 (233ppi) and considerably more defined than the Samsung Galaxy Fame (165ppi) which Motorola took great joy in shooting down at the Moto E launch. Surprise, surprise the Moto G and Moto G 4G both sport a 1.2GHz quad-core Snapdragon 400 processor, backed up with 1GB of RAM and an Adreno 305 GPU. That's enough power to run even the more demanding of applications, and even though load times may not be as lightning quick as top of the range phones, they are far from sluggish. The Moto E makes do with a 1.2GHz dual-core Snapdragon 200 processor and an Adreno 302 GPU. The good news is that it still sports the same 1GB of RAM. It shouldn't have any trouble running Android KitKat (which it does), but the more graphically intense applications may cause it some strain. All three handsets come running the latest version of Google's mobile platform - Android 4.4.2 KitKat. 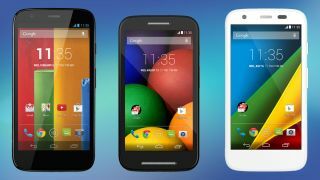 Motorola has kept with stock Android instead of implementing its own interface, giving you the pure Google experience. What you do get is a selection of Motorola applications pre-installed including Assist (providing help if you get stuck with your handset), Migrate (helping you get data from your old phone to your new Moto) and the new Alert (which lets you share your location with friends and family). As you get more power in the Moto G and G 4G, Android runs a little smoother and a little quicker, but there isn't a huge performance gulf between them and the E.